Reagan had a good night last night. She slept all the way through til 9am! She's been in another great mood again today. My only complaint would be the spit. She's still super spitty. She's got this red rash on her face and we can't figure out whether it's from the spit or from the mittens we've been putting on her hand to prevent her from biting herself (which she keeps rubbing on her face). Today we put her in her swing again and she fell asleep in it. She slept for almost 2hrs in that thing! Grandma spent most of the day beefing up our Halloween decorations. We were the most decorated house on our street when she was finished! 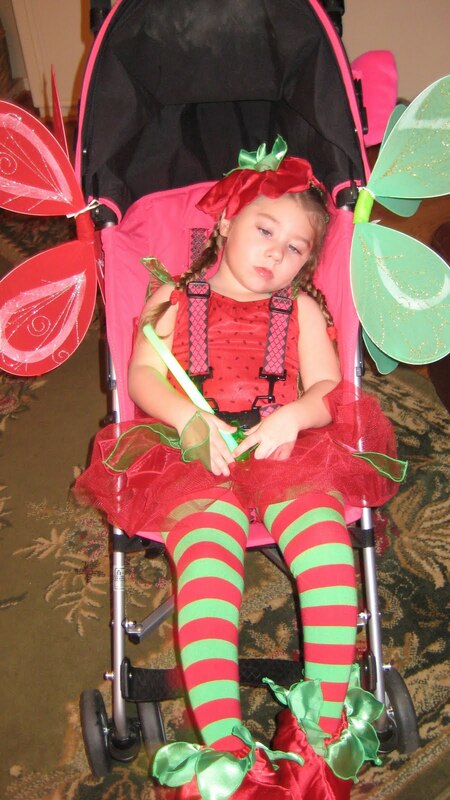 Tonight we got Reagan all dressed up in her fairy costume and took her trick-or-treating. She seemed to enjoy herself. She had a light up wand that she was really interested in. Look at those long fairy legs! Reagan was a read turkey last night. She spent most of the night awake, kicking around in her bed and laughing to herself. I guess she didn't feel the need to sleep since she slept so much the day before. We tried with varying levels of success to get her back to sleep, but even when we succeeded it was short lived. Oh well, at least she was a happy girl. She's actually been great all day today. Super smiley and content. Today Mike installed a swing for Reagan on our back porch. We've had it for a while and just never got around to putting it up. She definitely seemed to enjoy it. It's finally a little cooler here in Houston and it was a nice day for swinging! 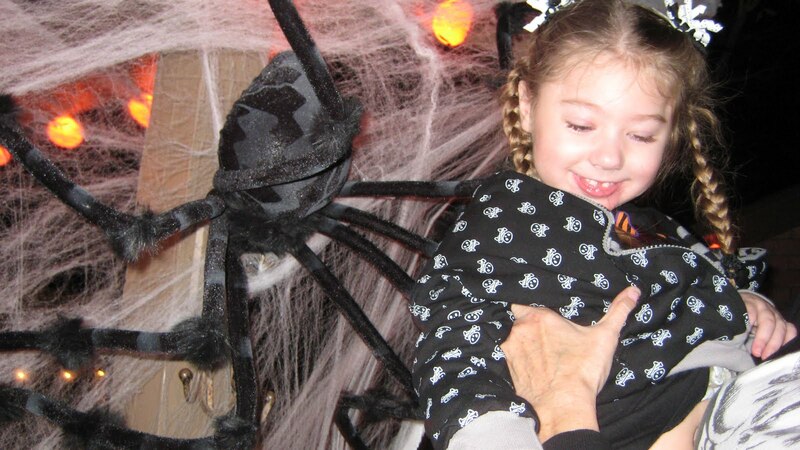 We even took her to a Halloween party down the street tonight. She was such a good girl. She is such a good girl! Now all we need is a good night's sleep! Reagan fell asleep last night at 11pm, without the help of medication (although I still gave her the clonidine just in case). She was out like a light. Totally relaxed. I don't think she moved a muscle all night...this morning she seemed to be in the exact same position as when Mike laid her down last night. And she was still asleep. Every now and then she'd stretch and smile real big. I would go in and try to encourage her to wake up, but those eyes would just roll back and she'd be out again. She slept a total of 16hrs straight...from 11pm-3pm. She was up for less than 2hrs when she dozed off again. Yes, that's a lot of sleep but I think it's exactly what the doctor ordered. She slept another couple hours and then woke again. Both times she woke today...she was not happy. She woke screaming crying but we think the culprit may have been tummy pains because she was having some serious gas. She settled down and has been quite sweet and smiley ever since. She's beyond spitty though. Like a faucet, you have to keep her draining at all times or she chokes. Not sure what that's all about. I'm hoping for another night of sleep tonight and a good day with my happy girl tomorrow! Thank you all for your prayers and support...today has been a better day. Last night was another ridiculously long night. I gave Reagan her clonidine at 10:30pm and waited. And waited. She didn't doze off until 12:30am! And then she woke at 1:30am! Ugh. She was content to lay in her bed another hour or so and then I got up with her around 3am...and we've been up ever since. So last night she got 1hr sleep, the night before 50min, the night before a few hours, and the night before that a few hours. This child (and her parents) are severely sleep deprived! You could tell she was exhausted...but she just couldn't sleep. She was still very fussy last night. She'd have outbursts of crying or she'd yell out all of a sudden (scaring the you-know-what out of me). She was still making gagging faces and the occasional retch, but no actual throw up. Her poor little lips were all crackly and bloody from throwing up nonstop the day before. She was a sight. This morning she was slightly improved but still very sickly and not at all herself. She was still doing the occasional gag but she's been very spitty again so that could be part of the problem. We took her into the pediatrician first thing and her poor little throat is completely raw from all the throwing up yesterday. She does have a minor ear infection in that right ear (again). I think that probably contributed to her overall fussiness but the main issue is just that she was just going through another one of her really bad cycles. This afternoon you could definitely see the tide changing. She seemed to get better and better as the day went on. She was laughing here and there and her eyes finally have their sparkle back. She's interacting with you again...she's no longer zoned out and miserable. It's so good to see my sweet girl again. I'm hoping she's be completely back by tomorrow. What she really needs is a good night's rest tonight...please keep that in your prayers. Grandma is coming in tomorrow morning, so that should definitely lift her spirits! I'm posting way early today because we could sure use some prayers now, rather than later. It's been a horrible, terrible, awful day. 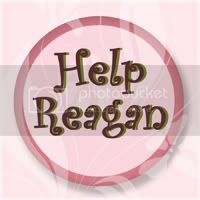 Reagan's nausea started up last night...and has continued to go on strong all day long. For starters, she didn't sleep hardly at all last night. When I first put her down she slept 30min, then I sat up with her til 1:30am when she fell back asleep and only slept another 20min! 50min all night long. The rest of the night she kicked and flailed nonstop in her bed. She was strangely more content just laying there by herself, than being picked up. Finally around 6am I heard her coughing, so I decided it was time to just get up with her. The second I picked her up the fussing began and so did the nonstop gagging/retching. Horrible...just horrible. This is so frustrating to me...there is nothing we can do to help her. Can you even imagine how horrible it would be to gag and retch literally nonstop for an entire day?? And the chorea is out of control too. Her whole body is so tense, she's trembling all over. She's constantly moving...arms flailing, legs kicking, trying to lean forward, trying to swipe at her face. She can't get comfortable for even a second...she's miserable. Moaning, fussing, staring off into space. It's painful to see her like this. We tried venting her g-button and while we were able to drain a good amount of yellow tinged fluid/foam...it's not helping to reduce her nausea at all. I wish we had something that would work...something to stop this nausea. Or even something that would put her to sleep. Why is it that we can't find a single nausea or sleep medication that will work on her?!?!? I'm beyond frustrated. This girl needs some relief and she needs it now. We need some serious prayers...ASAP. Sleep was pretty bad again last night. After that double dose of clonidine, Reagan only slept 45min. Yep, that's it. Then she was up...and very fussy. So from about 11:45-3:45 I sat up with her crying in my ear. Not fun. She would doze off occasionally but each time she'd startle awake only a few min later. Finally when she did fall asleep, I was able to lay her down and go to sleep myself. I put an arm restraint on her just in case she did wake back up. I woke this morning to find her still asleep but completely uncovered and arm restraint laying beside her. At some point she must have woken back up and wiggled out of her arm restraint and covers. Around 8:45am her pump started alarming (this time it was actually out of formula) and woke her up. She was not happy. Her nurse managed to keep her semi-calm for a while but as soon as she laid her down to change her diaper, that was it! The crying started right back up. The movements are much worse today as well. She definitely seems to do better when you hold her tight or put a weighted blanket on her to try to lessen the movements. She had both OT and PT today but they spent most of their time just trying to restrain her and keep her calm! Tonight the nausea started up again and she had several really big throw ups. Poor thing. I really hope she gets some sleep tonight because this nausea really wears her out. I decided to go ahead and start her on the new anti-nausea med tonight. The name of it is nortriptyline, it's the active ingredient in Elavil. It's really a anti-depressant but it's also used to treat nausea/vomiting associated with cyclic vomiting syndrome. It sure would be nice to find something to help with her ongoing nausea. Please keep it in your prayers that it actually helps her and does not have any bad side effects. Last night was another super long night. Reagan woke up only an hour or so after we put her to bed. She was VERY fussy, crying nonstop! Mike got up and helped me get her back to sleep. Unfortunately that only lasted an hour or so before she was back up again. This time she was a little less hysterical. She and I watched some tv for a couple hours and then she fell back to sleep. I put her in her bed for another hour or so before she woke again. We sat up for another hour or so until she fell asleep. She woke again less than an hour later (around 6am ish) but she wasn't fussing so I just left her and she eventually fell back to sleep on her own. She then slept til about 11am...which was the longest stretch she slept all night. She woke cranky though and has been fussing/crying most of the day. When I say fussing/crying...I don't think you really understand what we're dealing with. It's a crazy, schizophrenic cry...like she's screaming at herself. It really is more of a yell than a cry. And it's nonstop, all day long! She's gotten increasingly hoarse as the day has gone on and I'm sure that's not helping her mood. She's still very spitty and she's even developing a red rash on the left side of her chin because of it. She hasn't really been gaggy today but she did make a few gaggy type faces here and there...I'm sure that's because she's trying to manage the extra spit from all the crying. She's also moving a lot and constantly trying to bite her hand. When you hold her over your arm or on your shoulder, she opens her mouth and puts her teeth on you! She doesn't actually bite down, but she does remind me of a little vampire! Needless to say, she has been a holy terror today! Tonight we're trying a double dose of Clonidine to try to settle her down. I hope she at least gets a couple hours of rest and wakes a little less crazy! Last night was not a good night. Reagan woke up only an hour or so after we went to bed. 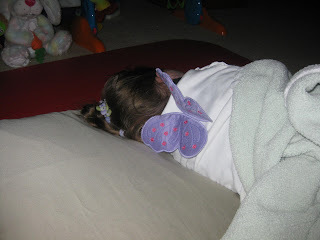 She was frantic, crying and kicking her legs up a storm, but she wasn't really awake. She never even opened her eyes. We tried for quite sometime to snap her out of it...all the crying even woke Grandma and she was finally able to shush her back to sleep (on her wedge on the floor in the living room). I was afraid to move her, so I laid down on the sofa and we both slept for about an hour. When she woke, she had snapped out of whatever it was from before. I wouldn't say she was happy, but I was able to at least keep her calm. We sat up for several more hours watching tv. Around 5am Mike got up and laid in bed with her and managed to get her to go back to sleep. I slept til 8am when I had to get up to take my mom to the airport. Reagan woke up shortly after I got back, and to my relief, she woke with a smile. She was content all morning. I wouldn't say she was "happy" (you still had to work a little to keep her satisfied), but she was content. This afternoon I went to a baby shower...sometime while I was gone it all started to unravel. She was a little bipolar...going through bouts of laughing and then screaming crying. She did have two dirty diapers today (for the first time in a few days) so maybe it's all tummy related. However you want to look at it, I think this is the beginning of her "bad days". This afternoon she was actually much worse for me than for Mike. He was still able to get her to laugh here and there...she only wanted to cry for me! All the crying didn't help her manage her spit very well and tonight when I was holding her she threw up a bunch of foamy spit all over me. After that she seemed to calm down a little and fell asleep for Mike. That only lasted a little while before she woke fussy again. I'm afraid we're in for another long night. Please keep her in your prayers...we could sure use some sleep and a less fussy day tomorrow would be appreciated. Reagan slept well last night and so did Mommy and Daddy. I still woke up a couple times, but it had nothing to do with Reagan and I didn't have as hard of a time going back to sleep as the night before. Reagan slept in til after 9am again and woke happy. She's been in another laid back, happy mood today. She's still very smiley but we haven't gotten any laughs out of her in a few days. The hands are still in the mouth nonstop, so she's been wearing her mitten a lot. She's also still very spitty...drippy spitty at times. This afternoon my sister came to visit. We haven't seen her much since she moved to Dallas, but you could tell Reagan was happy to see her. You can always smell my sister from a mile away...she wears lots of perfume but I think Reagan likes it! Then tonight we went to a birthday party for one of our nephews. Reagan was still in a great mood and hamming it up for the relatives. So nice to have her in a good mood for everyone to see. She's been super precious again today. Praying for continued good days ahead...and continued sleep! Reagan did sleep last night but it was a restless sleep. I kept waking up because I'd hear her moving around and each time she would move her arms around but never opened her eyes. I'd jump out of bed and go to her only to find her completely still and asleep when I got there. I did this the entire night...sometimes multiple times an hour. I have no clue what was causing me to sleep so lightly but it sure made for a mega headache today! Reagan has been in a great mood today (she did wake up to her Grandma this morning so maybe that helped). She's been very relaxed and mellow. She's still really licking at those hands though. They're constantly up at her mouth. Grandma and the nurse took Reagan for a long 1hr stroll today around our neighborhood. I have to admit, I'm guilty of not taking Reagan out much (or at all). Now that the weather is getting more mild here in Houston, I really need to make a point of taking her out and letting her experience "outside". She needs the vitamin D (and so do I). Other than that, today has been a pretty uneventful day. No therapies whatsoever. Just taking it easy. Hopefully we'll have another easy going day tomorrow (and more restful sleep tonight)! Reagan slept last night!!!! Very exciting, although I still feel pretty wiped out today. She actually was still asleep at 9:15am when we had to start getting her ready to leave for her ophthalmology appt. Thankfully she woke happy and we headed in for our 10am appt. If you remember, we had an appt with ophthalmology just a few weeks ago, but that was with her cataract surgeon and we wanted to switch back to the doctor that specializes in Cortical Visual Impairment (CVI). Not to mention, that last appt was on one of Reagan's bad days and she was crying nonstop (and her interocular pressures were reading high). So for the appt today they dilated her eyes and rechecked her pressures. Reagan was beyond good. They put lots of drops in her eyes and pressed that thingy on her eyeball over and over to get pressure readings and she never made a peep! Pressures looked really good today. Optic nerve looked good. Her eyes are pretty similar to where they were last year because they said the prescription on her glasses will still work for her. The doctor thinks we should give the glasses a try again. Maybe since she's a year older and not having seizures anymore, we might see a benefit from the glasses this time around. She suggested using them during therapies and school...anytime we want her focusing on something up close. 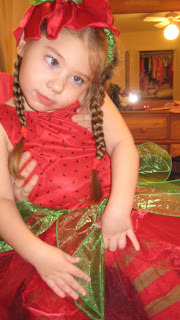 Of course, we gave it a try this afternoon for therapy and she was swiping them off the second I put them on her face. After a few swipes, we took them off and let her therapist just focus on working with her. We'll have to give it another try tomorrow maybe. She's been super spitty today and the hands have been up to her mouth nonstop. Lots of licking on her fingers. Her therapist had to use the arm restraints just to get her hands out of her mouth! After PT, her teacher came with the speech therapist from the school district and they worked with Reagan while she stood in her stander. It's been another very busy day. After everything was done and over with she fell asleep laying over the nurse's leg. Poor thing. She was very spitty and having some gas, so she put her in this position and she seemed to be more comfortable...so comfortable, I guess, she fell asleep! Such a sweet girl. Praying for more days like this (only maybe a little less spitty)! So little miss sunshine went to sleep last night and we were sure she was going to sleep through the night! She was out cold! I kept checking the monitor, but she was out. Then at 3am I hear her. Wide awake! Ugh. I feel like I'm never going to get any quality sleep. I sat up with her from 3-5:30am at which point she was groggy but still not asleep. Truthfully I'm not sure if she ever went back to sleep. I think she may have dozed a little, but I don't think she actually slept well. This morning she was still making gaggy faces, but she never actually threw up. She was super spitty though and we had to keep her on her side to let it drain out in an attempt to keep her from choking on it. 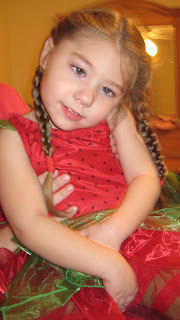 This morning she had vision therapy and at noon her teacher came with the OT and PT from the school system. I'm not a fan of multiple people coming at once. It's just too much for her. Too much chaos. Too much talking. Too much. Reagan held her own and did fairly well (considering). Then this afternoon we headed out for an appt with the sleep doctor. 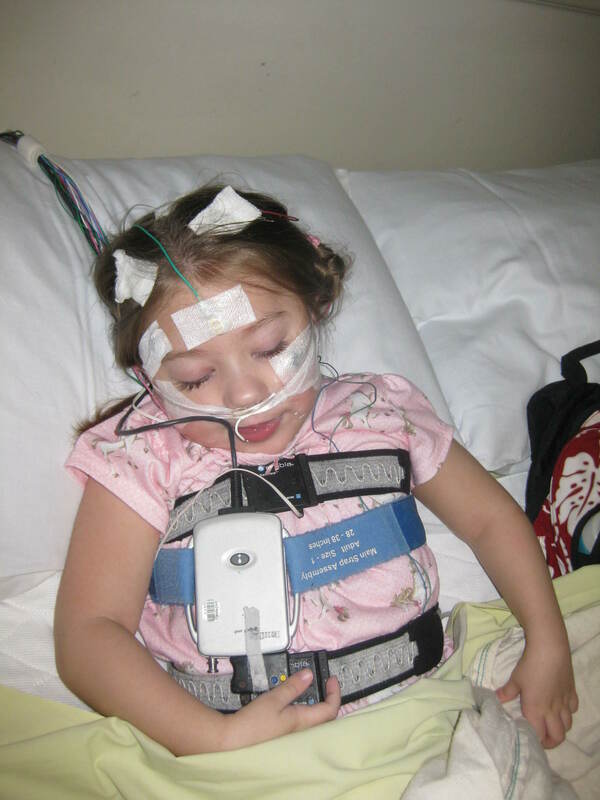 She only had the initial report on the sleep study and wants to get the study itself so she can review it in detail, but there were periods of apnea (mild) and her CO2 was higher than they would have liked. She had a prolonged latency to REM sleep of 347 min. That means in the 7.6hrs that they monitored her asleep, it took her 5.8hrs to enter REM sleep! I don't find that too surprising, but this was a "good night" sleepwise. Imagine on her bad nights. So the first thing the doctor wants us to do is go get checked out by an ENT. Make sure her tonsils/adenoids aren't enlarged and causing problems. If that checks out then she wants to try her on allergy medication again. 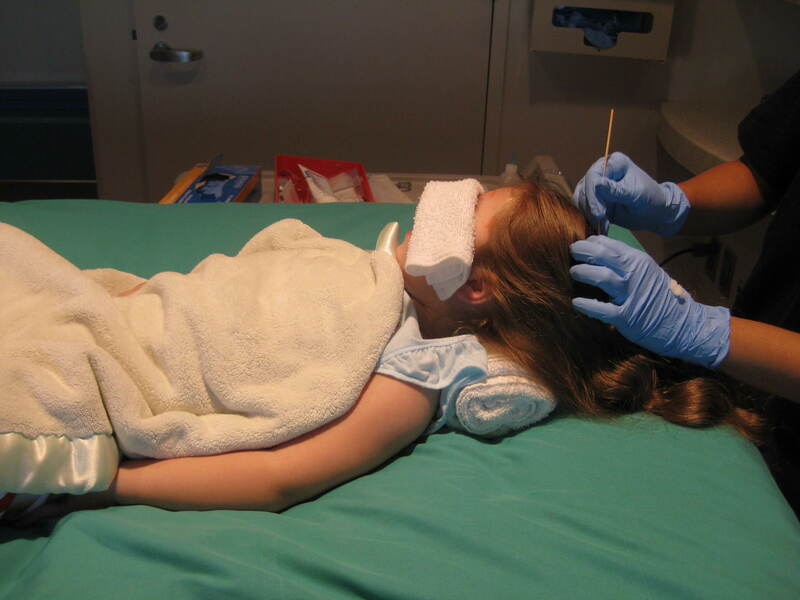 She looked in her nose and said it was pretty inflamed. Not surprising considering I have HORRIBLE allergies. And then the very last thing to try would be CPAP (which Reagan may or may not even tolerate). No real suggestions on what to do or what to try in the meantime...so that's a little frustrating. And no guarantees that any of these plans of action are even going to work for her. I tend to think her sleep issues are more neurological and that she can't sleep on her own like you and I. But what do I know...I'm not a doctor. Well actually I am, but not that kind. Reagan made it all day without any throw ups and then this afternoon she had three big ones. That spit is really wreaking havoc on her. She's a gurgling mess. This didn't quite turn out to be the good day we had hoped for. She was in a happy/laid back mood but she didn't sleep well last night, she was spitty/gaggy, and she still threw up multiple times. It seems that the line between good and bad days is getting blurred a little. Please continue to keep Reagan in your prayers...for some decent sleep tonight (maybe even some REM) and actual good days ahead! Reagan slept til 5:30am this morning. She woke and was moving around (chorea, not a good sign) but she wasn't fussing or anything. I left her there til 7am when I heard her gagging (not a good sign). Today has been another day full of throw up! She wasn't throwing up "non-stop" but she was very nauseous and threw up very often and each time it was a lot of clear foamy/mucousy fluid. Poor girl. We are SO sick of throw up. Our day started with throw up and now it seems we're ending it with throw up! Through it all Reagan has still managed a laugh here and there. This morning she was a little more cranky but she mellowed out as the day went on. We had back to back appts with the mitochondrial doctor and a new movement disorder doctor today. The mitochondrial doctor was 2hrs late again, so when she was done we just waited in the office for the next doctor! Nothing much to report. She said the results of the genetics test were back and they didn't show anything of interest. Long story short, Mike ended up having the exact same mutation (and gave it to Reagan) so since Mike doesn't have mito, that can't be what caused Reagan's mito. She suggested enrolling us in the study at Baylor...the one Reagan's already enrolled in...so there's nothing more we can do now but wait to see how that study pans out. She said the results of Reagan's sleep study were in and she is having some episodes of apnea. She suggested that we make an appt to see the sleep doctor...the one we're already going to see tomorrow. Done. So we'll see what she says. I'm hoping this is not something severe enough that we'll have to treat...but we'll see. 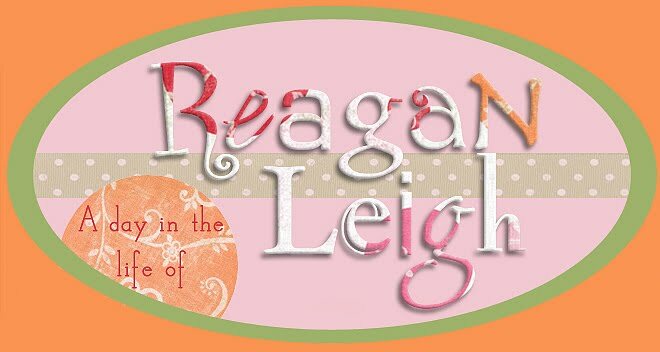 The mitochondrial doctor reiterated that although these cycles that Reagan is going through are difficult on us, overall she thinks Reagan is doing really well (I guess she means healthwise, considering she has mito). Then we saw the movement disorder doctor. Reagan was not having much chorea at all...she was actually holding very still (of course). So we're going to send him a video of the chorea at its worst and we'll see if he has any recommendations. So that's that. Busy day (aren't they all). Please keep Reagan in your prayers. We SO need a good day tomorrow. NO more throw up!!! Today was another bad day. Reagan was up a lot last night. Her stupid pump woke her up twice beeping with a "no flow out" error!! I thought I was going to lose it dealing with that pump. Finally I got it working again but the damage was already done...Reagan was up. Eventually we did get her back to sleep but she kept waking back up. This morning she was still very fussy/crying her breath away but then she switched over to moaning. We're talking nonstop moaning and groaning all day long! That proved to be quite annoying, but something was obviously bothering her. She had one throw up this morning and then two tonight. Poor thing. Today was another one of those wasted days that you spend the entire day just trying to get through it. I wish tomorrow were going to be better but this is only bad day #2 so history tells me we've got AT LEAST one more bad day to go. We've got a super busy week this week with doctors appts nearly every day. Oh fun. Please continue to keep our little one in your prayers! Today marks the end of the good streak. Reagan was up most of the night last night. She woke up less than an hour after I laid her down and she was super fussy and whiney. It was a looooong night! I sat up with her off and on most of the night. I was beyond exhausted and seriously running out of patience! Finally around 5am I couldn't take it anymore and had to lay her down. I was falling asleep holding her! She eventually fell back to sleep and then proceeded to sleep in til noon! What a stinker! I had to get up and give her medicines, so I didn't even get to take advantage of the fact that she was sleeping in! When she did wake, she woke with a vengeance! Lots of crying, lots of fussing left us wishing she would have slept in later! She was super high maintenance today. Most of the time she was fussing or crying, but there were instances where she would babble and squeal or we could get her to laugh (her crazy laugh). Lots of tension today and chorea. She was constantly trying to bite her hands. We got some mittens to put on her...she licked them a lot and eventually did succeed in biting her finger. Once she bit the finger, that was it...she cried the rest of the day. Tonight she got herself into such a crying fit that she was not breathing and turning purple! She was yawning most of the day and finally around 8pm started dozing here and there on my lap. I gave her the clonidine early in hopes that it will help keep her asleep. If/when she wakes up, she's not going to be a happy girl! Please keep her in your prayers...something is definitely bothering her right now. Last night was lacking in the sleep department. I didn't put Reagan to bed til about 11pm and she was already up making noise at midnight. I got her situated and put on her arm restraint and then went back to bed. I'm not sure if or when she went back to sleep but around 4am she woke me up again. I went to her room and she was laying there making all kinds of sweet little sounds. I changed her diaper, she usually won't pee during the night if she stays asleep but she was awake a lot last night and once she gets wet, I think it makes it hard for her to go back to sleep. I picked her up and tried her out in my bed. She was just not going back to sleep. So we got up and watched some early morning tv (or infomercials). We called grandma around 5am because we knew she'd be on her way to the airport. Reagan was laughing and talking it up for Grandma. Finally around 6am she dozed back off. I got up and went to the airport to pick up Grandma at 6:45. Thankfully Reagan slept the whole time I was gone (a relief for my Dad, I'm sure) and she then slept til about 10:15am. We woke her up because she had OT scheduled. She woke up a little startled and upset but calmed down quickly and did fairly well with OT considering she had just woken up. She was very tight, lots of extension, in her legs especially. I definitely think we've seen an increase in chorea, but she's still happy so that's good. I was thinking about it today and this is the first week (maybe ever but certainly in the last several months) that she has made it to every single therapy/school session for the week. Pretty impressive. That's one good week. She's been super spitty today (and not managing it well). She's been like a fountain really. Everything is soaked. We've had to keep her on her side a lot, that way it can just trickle out and not choke her. She's been super talkative today. Lots of babbling/squealing noises! So cute! It sounds like she's really trying to talk to you. I got a small snippet of it on video (I broke out the video camera and immediately she stopped talking). Most impressive is probably her head control on the second video. She was sitting up so big and tall on Grandma's leg. We tried her in her bouncy seat today. 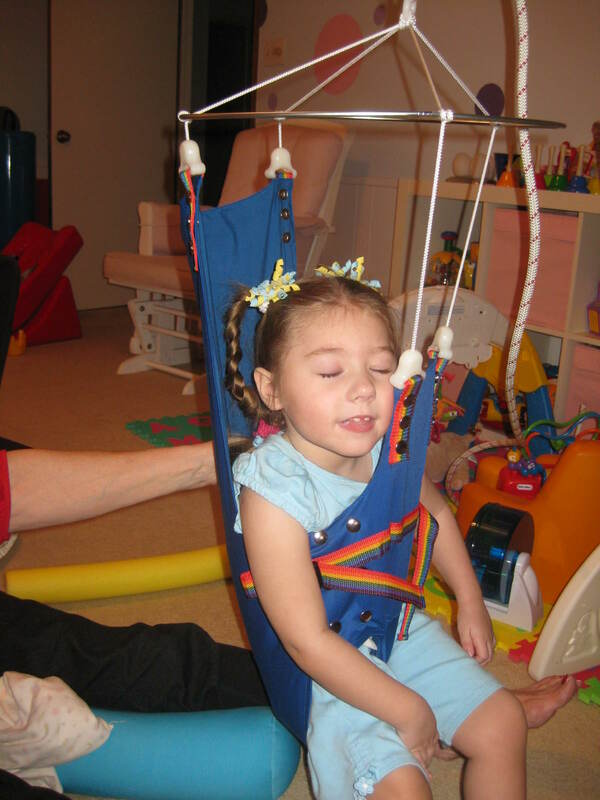 I ordered the merry muscles (for special needs) 3 months ago and we finally just got it in this week! Unfortunately, it looks to be too big for her. Without anything boosting her up on the inside, her head doesn't even poke above the top of it. With the huggabebe giving her some side support, it boosts her up even with the hard plastic knobs. We haven't really figured out a way to get it to work yet. Now I'm wishing I would have bought the smaller and much less expensive merry muscles (for babies). I put Reagan down to sleep last night around 11:15pm. I woke up at 3:15am and saw her moving around in her bed. I went in there and her eyes were still closed but she was moving her arms around a lot and still trying to put that left hand in her mouth! I checked her diaper and it was wet, so I went to pick her up and realized I never hooked her back up to her feeding pump last night!!! I had it all ready to go, but must have forgotten about it. I guess it's a good thing she woke up! I changed her diaper and then took her back to her bed. I tried my best to keep that hand away from her mouth but finally I just put the arm restraint on her. 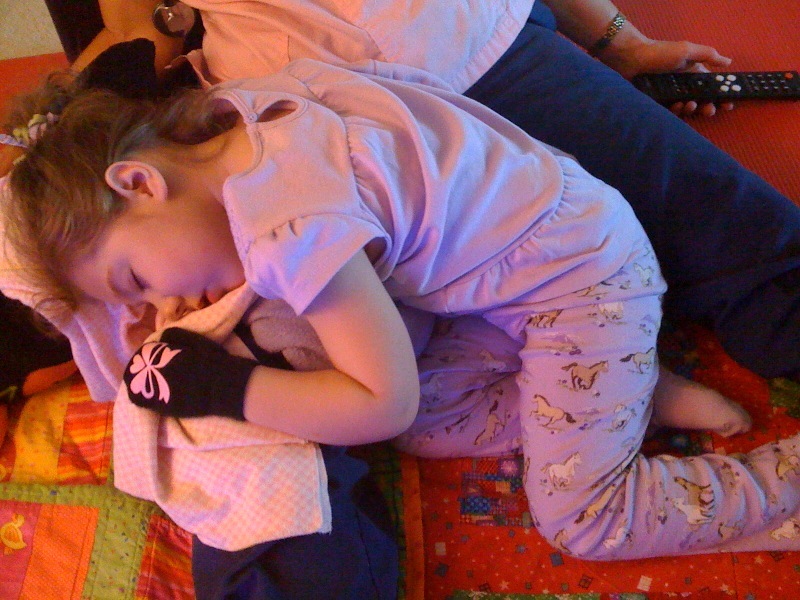 Having that arm completely immobilized helped her to settle down and she was back to sleep in no time. She then proceeded to sleep through til almost 10am this morning! She woke smiling again (much to my relief) and she's been in a great mood ever since. She had a super busy day this afternoon with OT, PT, and then her teacher and school speech therapist together. All back to back to back! She did amazingly well. She stayed smiley and happy the entire time. At the end of her PT session, her therapist put her in the stander and she stayed in there the whole time the teacher/speech therapist worked with her. She looked GREAT. That new headrest is really working well for her. She's been a little spitty again today...making nonstop smacking movements with her mouth. I was worried last night when I saw her doing this, thinking she might be getting gaggy again, but she really hasn't been gaggy at all today (but she has coughed occasionally because of the spit). Tonight she was so cute making little mumbling talking noises. I think I heard her say Ga Ga! I think she knows her Ga Ga is coming tomorrow! I'm hoping the good days continue! Looking darling as her nurse reads Bible stories to her! Reagan has been a sweetie again today. She slept well last night and woke smiling once again. Love those smiles. Still having a hard time keeping that hand out of her mouth today. She had vision therapy this morning and the OT (from the school system) came as well. She was very impressed at how well Reagan was doing with her head control. It must have been really bad the first time she was here because I don't recall it being exceptionally good today. At noon her teacher came for the first time in months! Reagan has literally been not feeling well or at a doctors appt every single time the teacher was supposed to come over the last however many weeks. Today she sang some songs to Reagan, went through some flash cards, and read some books to her. It was probably the best "school" session she's had to date. I'm not sure how interested Reagan was but it sounded pretty entertaining to me! This afternoon my Dad came in (since Mike left for Canada this morning once he found his passport) and we just hung out most of the night. I picked Reagan up and had her laying up against me with her head over my shoulder (so she couldn't lick/bite on her hand anymore)...the next thing I know my lap is warm (so I'm thinking she peed on me, which she did) and then I see poop bubbling out the back of her diaper!!! It was all over me, all over her...HUGE mess!! Seriously, never a dull moment! So as I'm cleaning up the mess, my phone keeps beeping, Mike is texting me with pictures of how beautiful Vancouver is!!! Something is wrong with this picture!! Reagan has been a sweetie again today. She slept the night through and woke up at 7:30am smiling. She's been very quiet and content today. Still crunching forward a lot and wanting to lick on those hands, but overall she's been more still with less movements. She had OT this morning and the head control was definitely lacking. 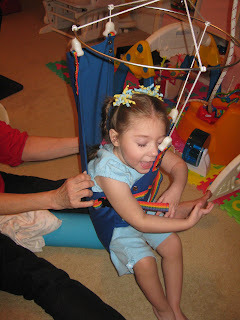 Then this afternoon during PT all she wanted to do was crunch forward and that included when she was in her stander. She fell asleep after only 20min in the stander, so we went ahead and took her out (maybe that's how she had it planned). She took a good long 4hr nap. Any time she falls asleep during the day, we just let her sleep (obviously her body needs it)! 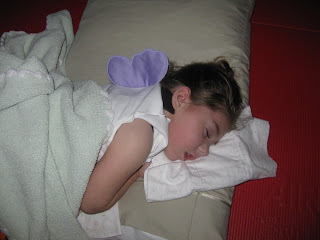 She looked like such an angel sleeping away with her little wings sticking up from her back (see pic). Finally around 7:30pm, I picked her up and gently encouraged her to wake up. She woke with a smile. Such a sweetie! Her temp was back down again today. No clue what that was about yesterday. Mike leaves tomorrow for Canada. The last time he went I had to hear him go on and on about how beautiful it was there (Vancouver Island)...must be nice. Thankfully my Dad is going to come in and stay with us Wed-Fri and my mom will be here Fri-Sat. Ever since my Dad retired he's been so great about coming to help me anytime I need him...and my mom, well, you just can't keep her away from her Reagan! She works full time but still comes and visits us almost every weekend! It's very nice to have that kind of support! Of course my mom keeps asking me if Reagan is still going to be in a good mood by Friday. Unfortunately, I can't guarantee that. I'll just enjoy it while it lasts!! The wings are attached to her shirt that says "I believe in fairies" on the front!! It didn't seem like Reagan was going to go to sleep last night. We tried our best to get her to fall asleep and then finally just laid her in her bed and let her be. She was kicking and squirming around, I thought it was going to be another all nighter for her. Turns out, we were wrong. Every time I woke up and looked at the monitor, she was still and asleep. She slept til 9am this morning when she started coughing. She was super gurgly, so I picked her up and forced her to wake up to clear it. She coughed a lot and sounded pretty gunky for a while. She was very spitty and I guess the spit was just pooling in her mouth. Nonetheless, she woke happy and has been smiling all day. Very quiet...no laughs like yesterday...but very content. She's still moving a lot. Crunching up in a ball and turning on her side. Arms bent and hands up to her mouth where she can lick them. It's definitely more chorea than I would expect on a good day, but I can't think of any other way to describe it but a good day. When Reagan's happy, we're happy. That pretty much describes a good day. She was running a low grade temp today...100.2 in one ear and 100.6 in the other. Not sure what that's about...we'll have to keep an eye on it. Saturday she felt a little warm and was running 99.5 ish. This girl, always keeping us on our toes. We finally made it to feeding therapy today, only there wasn't much feeding involved. Instead her feeding therapist spent some time trying to loosen up her extremely tight muscles. Other than that, not much going on today. She's got OT and PT tomorrow so hopefully she'll be super sweet again tomorrow. 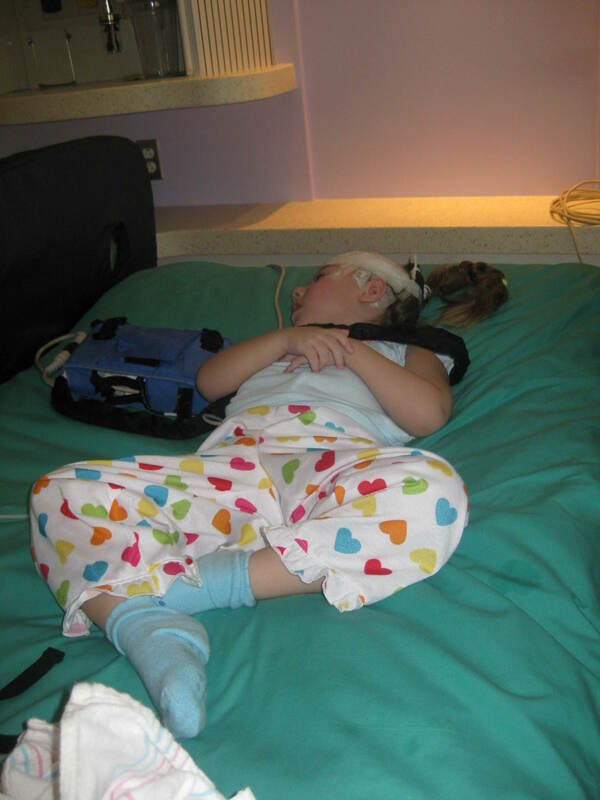 Thursday morning getting the EEG leads put on...sleeping away. Almost finished with putting the EEG leads on...not thrilled to be here (but oh so cute)!! Out cold...she slept most of the day Thursday. Friday once the chorea picked up...we had to put the arm restraint on her to keep her from biting her finger (again)!! Look at that bruised pointer! Home sweet home! Boy is it nice to be home. Reagan didn't sleep much at all last night. We put her left arm restraint on her and just let her kick and squirm around all night. She wasn't fussy, just extremely restless. Actually we've found her more fussy today when we try to pick her up...she prefers to have the freedom to move when she gets like this. Hands and feet are extremely cold and clammy again. Lots of chorea (hence the restlessness). I'm glad we got all of this on the EEG. We even got a couple of her vomiting episodes. According to the attending, none of what they saw was seizure activity (do I hear an Amen)!!! I can't tell you how thrilled I am to hear that. So now that we're home we're just riding out the last of these bad days till the good days return. We're guessing Monday, but tomorrow would be even better. Poor girl, she's just so restless...it looks like it's going to be another long night. Please keep her in your prayers! Reagan was up a lot last night. She woke only two hours after the clonidine...not a good sign. She was crying and not at all happy at first, but I think it was in response to some tummy pains, because as soon as she got some gas out she was OK. I was up with her for two hours and then finally got her to go back to sleep. Unfortunately that only lasted another hour or so before she was back up fussing again. I got up with her for another couple hours and then around 6am or so I tried her in our bed. She dozed off and on but overall she didn't get much sleep last night (me either). This morning she was sounding a little coughy/gurgly and next thing we know she was throwing up. She's continued to be spitty all day but she didn't throw up again until tonight. She's been in surprisingly good spirits today. You can tell something's off, she's very still and tired looking, but every now and then she'll throw out a giggle and a smile. Such a sweet girl. Tomorrow's the big day. We're going in for the 48hr EEG at 8am. Should be fun (not). 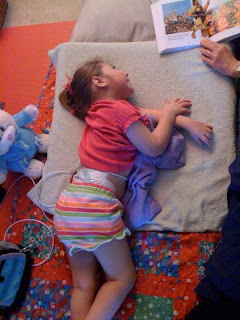 This is really just to get an idea of where she is seizure-wise. 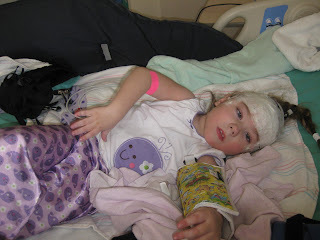 We don't think she's having any seizures but you can never be certain without an EEG. 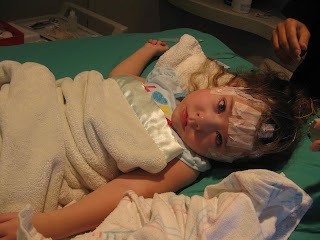 It's been quite a while since her last EEG (about 5 months), so it should be interesting to see what this one shows. Prayers for NO seizure activity whatsoever. And prayers for some sort of sleep tonight otherwise we're in for a LONG next couple of days! Thank you all for your prayers...Reagan had her 5th good day in a row today!! Sleep was a little lacking last night though, with her waking up around 1:45am fussing. I tried to put her in our bed but she was not going back to sleep so I finally just got up with her. I wasn't up with her too long before she fell back to sleep. I put her in her bed where she slept til about 7:30am. The smiles have continued today so that is certainly good news. We've seen an increase in spit though, causing her to cough/choke occasionally. She also sounds a little congested in her nose...but I'm guessing it's just allergies (I've got the world's worst allergies and I'm sure I gave them to her, poor thing). She's had 4 liquidy diapers today...I don't know if she's ever had that many dirty diapers in a day. I'm wondering if it's possibly because of the Augmentin she's on. Who knows with this girl. They didn't seem to bother her though...she was even laughing as she was filling her 4th diaper. Turkey. Today she had both OT and PT. She was such a good girl for both. This afternoon we tried out a new headrest for her stander. It's called an i2i. Reagan wants to crunch forward (like she does when she rolls) and it doesn't really give her the best posture when standing in her stander. 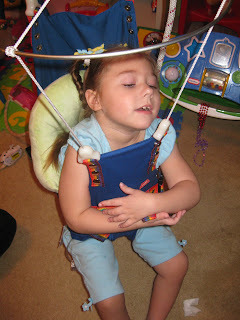 This headrest provides a lot more support and it essentially prevents her from leaning forward and to the side. I was surprised at how much better she looks in her stander with it. 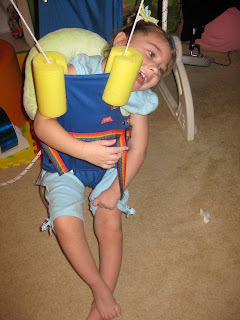 We also tried it in her positioning chair, but for some reason it just didn't work well in that. Sorry...I forgot to take a picture of her in it...I'll have to get one next time. We had to take her out of it a little early because she had dirty diaper #3. Tonight I went and played tennis again while Daddy had Reagan duty. She was a sweetie the whole time, smiling and laughing it up for him. Love these good days! Here's to a good night's sleep tonight. I'm exhausted! The sleep study last night went relatively well. We got there before 7pm but they didn't start wiring her up until about 8:30pm. I was amazed at the amount of junk they fit on that small little body. There were electrodes on her head (like an EEG), on her face, on her throat, on her legs. Then there were belts around her waist (3 of them)...one of which had a big box attached to it. And the most invasive of all were the nasal cannulas up her nose...two different ones (one plastic and one wire) which essentially filled up her entire nose. How they measure your breathing by blocking your breathing, I don't exactly know. Reagan was GREAT through it all. She just sat on our laps, smiling away. After they had her all wired up (9pm), I gave her the clonidine and she was out cold by 9:30pm. There was no clock in the room (and they wouldn't let me even have my cell phone on) so it was hard to gauge what time it was. I woke up several times, but most of the time Reagan was still fast asleep. She woke sometime around 4am, just stretching and smiling away. When they came in at 5:15am to take her leads off, she was already back asleep. She slept through the entire removal process (and even laughed a little as they scrubbed it off her head), then I used a wash cloth to semi-clean her hair and rebraided it and she was back asleep in no time. She slept the whole way home and then we put her into her bed. It wasn't too long before she was up again so I put her in bed with me and we snuggled. I got up at 9am but she slept in til 10:30am. She's been in another great mood today. Smiling away. Rolling. She's been great. 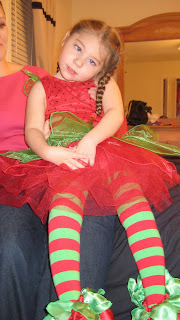 She had vision therapy this morning and then speech (through the school system) this afternoon. She was great for both. She was great all day. She did have one minor meltdown but turns out she had a poo poo coming, so that must have been what made her cry. I don't know if that's a small sign of things to come or what (since today is good day #4), but I'm still holding out for another good day. Pray for a record 5 good days! I'm just glad we're back home and will be sleeping in our own beds tonight. We've got a 48hr EEG scheduled for Thurs/Fri this week...so we'll have to enjoy it while we can. It's going to be a long week! All wired up last night. Not loving all those wires. In the stroller ready to leave this morning. Reagan slept well again last night. What can I say other than I sure wish every day was one of her "good days". When she's having a good day, everything is great. She's happy, smiley, giggly, content, she sleeps, she rolls...things just couldn't be much better. I can only imagine how wonderful it would be to get rid of the "bad days". She so wants to be a happy girl. All that said, her rolling is causing some issues with her feeding tube. She's been popping the medicine port open on her tube (like yesterday with Grandma) and she's also somehow twisting her tube around to the point where it comes detached from her tummy. Don't ask me how she's doing this but I've found it detached twice today and several times where it's about to detach! She's a turkey! In the past I would have really freaked out about something like this, but now she's so well fed now, we don't have to stress about those sorts of things any more. We used to spend 75% of our waking time trying to get food into her, but now that she has the feeding tube, that stress is all but gone. The only issue is when it leaks after giving her her medicine...that still stresses me out a little. Tonight we're going to go in for a sleep study. 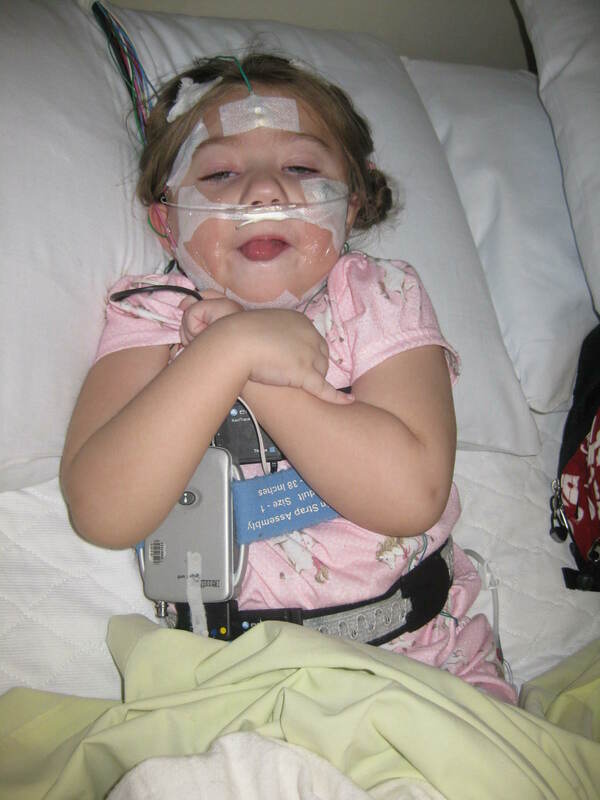 Reagan in all her years of not sleeping has never had a sleep study. For some reason her neurologist still doesn't think it's worth looking into, but her mitochondrial doctor felt otherwise. The only thing I'm unsure of is whether or not we should give her the Clonidine tonight. When she's happy and healthy, she sleeps like a charm with the help of Clonidine. Without it, I don't think she'd sleep nearly as well. 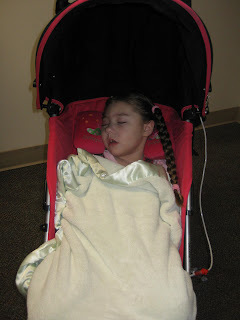 Truthfully, Reagan has never slept through the night without the help of some kind of medicine. In the past it was Klonopin, then Clobazam, and now Clonidine. It would have been interesting to do the sleep study when she was having a "bad day" because that's when her sleep is at it's worst (and the Clonidine doesn't help in the least). Problem is, on the bad days she'll go days without any sleep and they have to have her sleeping for a sleep study! So it should be interesting. We check in at 7pm and should check back out by 7am. Hopefully we'll all get some sleep tonight. Reagan's nurse has already called in sick for tomorrow...we SO need a back-up nurse. Please keep Reagan in your prayers...we need some more "good days" sent our way! Reagan slept well last night...she woke around 8am and was smiling from ear to ear. She spent all morning with Grandma while Mike and I went to the first annual mitochondrial family meeting. They had various doctors (most of which we already see) speaking on different topics relating to mitochondrial disease. We were able to ask questions relating to their talks as well as specific questions about our children. All in all, I think we got some good information and we met a few other families dealing with similar issues. One of the talks (given by our mito doctor) particularly hit home with us. She spoke about something called dysautonomia...dysfunction of the autonomic nervous system. We really think this may be what has been causing Reagan's "bad days". Unfortunately there's not an easy fix to this...we just have to treat the symptoms (I guess the problem with that is that up to this point we haven't found anything that works on her symptoms). In the middle of one of the talks I get a call from Grandma. Reagan's tube has popped open and now has a big air bubble in it. I had to talk her through the process of disconnecting the tube from Reagan...I thought she was going to have a nervous breakdown. She was in tears. It was so not a big deal, but it had her totally freaked out. Eventually (15min later) she finally got it done and I went back to the conference. Another interesting thing I found out...I spoke with the genetics doctor that had enrolled Reagan in that study to sequence her entire genome looking for mutations that may have caused her mitochondrial disease (the one that we weren't sure if they were actually going to include her in the study). Turns out, not only are they including her, she's going to be in the next batch of samples that they run. He also mentioned that she was an "interesting case" (always good when you're hoping to be included in a study) and he remembered all kinds of very specific info about her (they must have just been talking about her). Anyway...I was very excited about this because I had all but given up on the hope that she would actually be included in this study. This is our best chance of figuring out WHY she has mito. So all in all, it was a good outing. We came home to find our little one fast asleep. She took a super long nap, from 12:30-4pm, but she obviously needed it. She woke all smiles again and has been great all night. I took advantage of her good mood and put her in her stander for an hour tonight. She did great, especially for not being in it for a while (oops). When she's good...she's SO good. We just love these good days with her! Last night Reagan was a little tricky to get to bed. She fell asleep on Daddy but woke the second he got up with her to lay her down. So I took her for a while and she fussed (she was not loving the mommy yesterday) but finally fell asleep. She kept startling herself back awake over and over again, with arched back and stiff arms, but finally settled down and was out. She slept through til 5:30am at which point I got up with her and she was fussing up a storm. She woke Grandma with all the crying but the second Grandma took her...she was all smiles! Turkey, she just did NOT want her mommy. Since then she's been pretty laid back all day. Happy to be on the floor rolling...happy to be held...just happy. She had OT this morning and was doing great with the head control but very tight in the arms. She just wants to lick on her hands nonstop right now. She bit the you know what out of her pointer finger right around the cuticle. It's all red and puffy, it looks terrible. She's been pretty spitty/chokey today. She's gagged a few times today but I think it was more her choking on her own spit or gagging herself with her fingers than actual nausea. She's still been a little sensitive today, startling at loud noises etc..., but overall I would call it a good day. When she's happy, we're happy. Thank you for keeping our little one in your prayers!